"As a Livestock Policy Officer working for the Food and Agriculture Organization (FAO) of the United Nations, I have been asked many times by the press to report on the negative environmental impacts of livestock," explained lead investigator Anne Mottet, PhD. "Doing so, I came to realize that people are continually exposed to incorrect information that is repeated without being challenged, in particular about livestock feed. There is currently no official and complete international database on what livestock eat. This study contributes to filling this gap and to provide peer-reviewed evidence to better inform policy makers and the public." Despite these benefits, raising livestock is often pointed to as an inefficient system because animals consume food that could potentially be eaten by people. Some previous studies, often cited, put the consumption of grain needed to raise 1 kg of beef between 6 kg and 20 kg. Contrary to these high estimates, the current investigation found that an average of only 3 kg of cereals are needed to produce 1 kg of meat. It also shows important differences between production systems and species. For example, because they rely on grazing and forages, cattle need only 0.6 kg of protein from human food to produce 1 kg of protein in milk and meat, which is of higher nutritional quality. 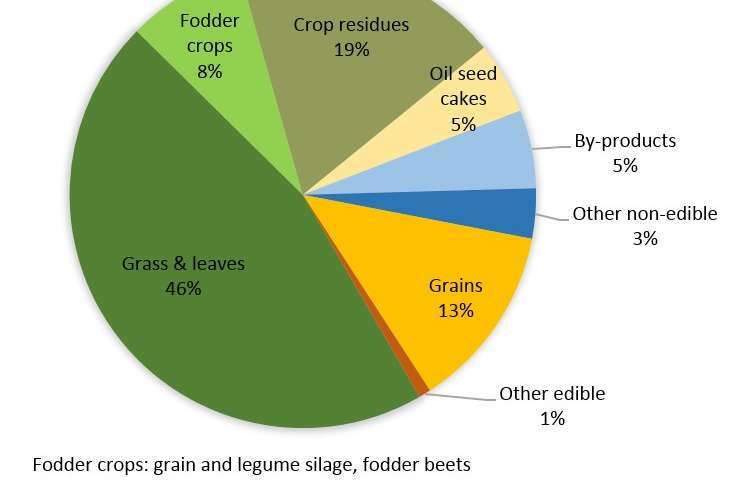 In addition, this study determined that 86% of livestock feed, which includes residues and by-products, is not suitable for human consumption. If not consumed by livestock, the study points out, these "leftovers" could quickly become an environmental burden as the human population grows and consumes more and more processed food. Researchers also analyzed land use and herd management. "The media often reports how consumers' choices can contribute to sustainable development, like through a vegetarian diet; however, erroneous information is provided regarding livestock feed requirements," noted Dr. Mottet. "We hear statements, for example, that to produce 1 kg of beef, we need large amounts of cereals. While we need to ensure that our diets are sustainable from a health and environmental point of view, the public and decision makers need accurate information to guide their choices." "Animal production, in its many forms, plays an integral role in the food system, making use of marginal lands, turning co-products into edible goods, contributing to crop productivity and turning edible crops into highly nutritious, protein-rich food. Quantifying the land and biomass resources engaged in livestock production and the food output they generate, but also improving our modelling capacity by including trends in consumer preferences, shifts in animal species, climate change impacts, and industrial processes to improve the human edibility of certain feed materials is arguably basic information needed as part of further research into the challenge of sustainably feeding 9.6 billion people by 2050," concluded Dr. Mottet.